Is Close Call vs. UCF a Reason to Worry About Duke's Title Chances? Give Mike Krzyzewski credit for saying the three most honest words of his coaching career. You could almost feel millions of heads nodding in agreement from coast to coast as Coach K made that confession on CBS moments after Duke escaped the clutches of Central Florida on Sunday. The sighs of relief from Duke fans must have created gusts back in Durham. The legion of believers who have Duke occupying the sweetest spot in their brackets may need a day or two before their pulses return to normal. This was the best dang upset that never happened. A one-point loss, 77-76, in which UCF repeatedly resurrected its slim hopes against the NCAA tournament's No. 1 overall seed. Duke won the game and also the wildly anticipated showdown between budding superstar Zion Williamson and 7'6" Tacko Fall. But UCF won more hearts, even if its own broke as the Knights missed two desperate but makeable shots in the final eight seconds that could have reversed the outcome. Should this give hope to the other 15 teams that are headed to the Sweet 16? Sure. To emulate UCF, all they'll need is to find one of the world's 40 tallest people by next weekend. After that, they'll also need a coach like UCF's Johnny Dawkins, who not only played for Krzyzewski's first Final Four team, but also sat by his side as an assistant for a decade. 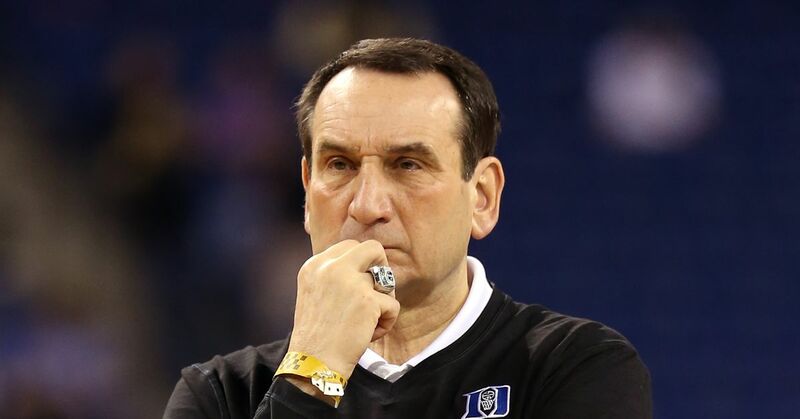 Dawkins probably can't read Coach K's mind, but after Sunday's game I wouldn't bet against it. The last element would be a deadeye gunner like Dawkins' son Aubrey, who scored 32 points and hit five threes against one of the nation's best defensive teams. And isn't it logical to believe that all those days the younger Dawkins spent in Duke's gym, just hanging out and being a kid, made him the rare opponent who's totally comfortable going up against the winningest coach in college basketball history? Even when Krzyzewski might be leading his best team ever? So yeah, that's all it will take to keep Duke from winning a sixth national championship under Krzyzewski. The crowning irony is that UCF would have been better off if Fall hadn't kept his promise to not allow Williamson to posterize with him with a dunk. With Duke down 76-73 and under 20 seconds left, Fall could have swallowed his pride and stepped away on Williamson's drive to the rim and given up an easy bucket without sacrificing UCF's lead. Instead, Fall stepped up to defend and fouled out while Williamson hit a two-footer anyway. That sent Williamson to the line, where his miss took a lucky hop off the rim and into the hands of RJ Barrett for a putback that was as easy as it was decisive. But Duke was exposed, to a certain extent. This was the Blue Devils' second sluggish start of the tournament, and they were fortunate to go from a tie to an eight-point lead at the half when UCF imploded with unforced errors in the final three minutes. The Knights also gave up a 7-0 run in the second half and bungled a chance to go up by six when they missed an alley-oop dunk with 1:55 left. Fall's 96-inch wingspan also gave Williamson enough trouble in the lane to force him outside. Unfortunately for UCF, the college game's best player got very comfortable out there, hitting three times from beyond the arc for nine of his 32 points. That helped reduce UCF's glass slipper to shards, but give the Knights credit for one other seldom-seen accomplishment: They visibly rattled Coach K.
After the Blue Devils allowed a 7-0 run to start the second half, Krzyzewski seized an opportunity during a timeout to rip into a young team whose four key freshmen ultimately accounted for 72 of Duke's 77 points. The CBS broadcast crew reported that Krzyzewski slammed the floor during the break and yelled, "How bad do you want this?" The accurate answer would have been, "A whole lot, but maybe not as much as Central Florida." Bill Raftery, who's 75 and has been courtside for about a gazillion NCAA games, volunteered that he hadn't seen Krzyzewski that upset in a long, long time. So instead of getting to their first-ever Sweet 16, the Knights have to settle for putting their school squarely on the college basketball map while watching Duke trek off to the tournament's second weekend for the 27th time. "They played great. ... They were deserving of winning," Krzyzewski said to CBS with a sincere voice that sounded ready to crack at any instant. "... I feel bad for Johnny. I'm emotional about it because I love him, and his son was magnificent." Duke was darned good, too, but will have to go forward with the knowledge that it might not be so lucky next time.